Southern cruisers Riding Club, Mt. Palomar Chapter is doing a 5th anniversary ride Sunday 6/26/11 and guess where they are going... Of course, to the Mt. Palomar Observatory on top of Mt. Palomar, about 5,500 ft. up the mountain. Weekday Rider John (Cuyo) knows a lot of these folks and I decide to join him for this Sunday ride to the mountain top. This will be my 2nd trip up to the top, but first visit to the telescope and observatory. To me, the South Grade Rd. up to the top is THE toughest mountain road I have ever been on anywhere and the ride with SCRC group is a real test of my ability as they are a spirited bunch of riders. THIS IS OUR STAGING AREA ON OLD HWY 395, ROUTE 76- THE ROAD TO PALA. View Larger Map This tiny burger hut does a fair amount of business, and the prices are not cheap. There is a safety briefing and then off we go. View Larger Map This is the route we took, although I'm not sure of the road between FLAG "C" and "D". Interesting side note, we head down Cole Grade Road with a 9% downhill grade for two miles, that's a fairly steep drop. ON THE WAY UP SOUTH GRADE Rd. TO PALOMAR WE PASS A RECENT CRASH SCENE. On a curve that looked very much like this a photographer was taking pictures of the motorcycle and bicycle riders as they passed. Someone on a motorcycle very likely took their eyes off the road for a split second, maybe to wave or something, and went into or over the guard rail. The ambulance roared down the mountain on the way to hospital as we were heading up. The police and photographer were still at the scene on the side of the road. These Google photos can be turned for different views. View Larger MapYou cannot take this road for granted no matter how good you think you are. 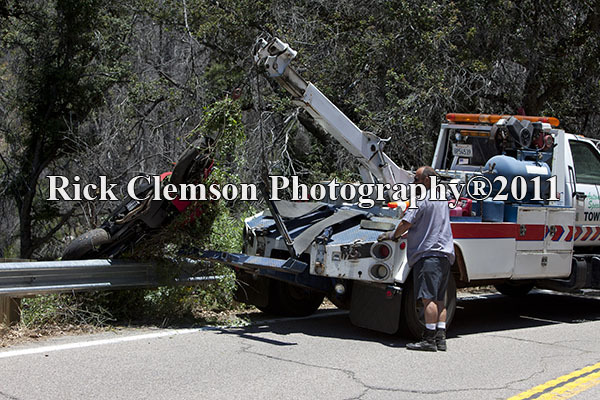 This is the actual sport bike being lifted over the guardrail. 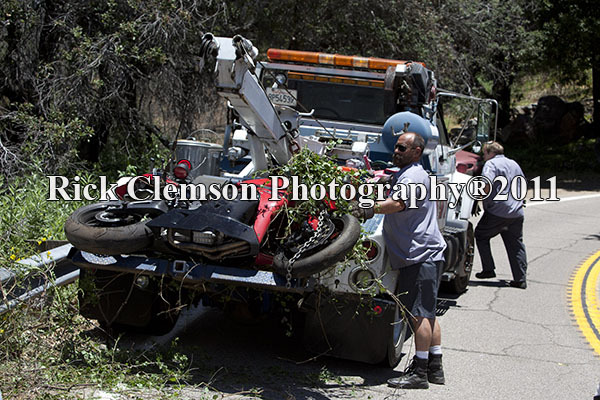 Wrecker pulling the sport bike out of the ditch. Another short segment of the road, all curves. We arrive at the observatory parking lot, all 23 motorcycles with 5 passengers, plus a truck carrying cupcakes, water and apples. in attendance were two Co-Founders, Slacker and HardHat Rick. Cuyo, Richard, Yuma, Uncle Bob, Uturn, Stan, Tammy, KnowFun, Janet, Jory, Boilermaker, Boomer, Nomad, Tumbleweed, EZBong, DesertBill, Junior and Kimberly, Frank and Audrey, Stewart and Carrie, Motorpig and LeeAnn, Kingpin, Greg, Helen and Mongo-as posted by Mongo on Delphi Forum. What is it with the road handles (names)? This was the end of the formal ride and our visit with everyone on top of Mt. Palomar. On STAR rides it's not over until we arrive back to Orange County, but since a number of attendees came from all over we split up and head our separate ways. John and I head down East Grade Rd. towards Lake Henshaw and Warner Springs on Hwy 79. The ride down is a little easier and I keep up with no problems. This is one of John's favorite stops- Aguanga General Store. I take out the Kool Vest and water it down as it is heating up on the road. We eventually hit temps of 98-99 deg. while on the road through Temecula, so that vest really comes in handy. After a quick gas and refreshment break on Clinton Keith Rd. we zip back up the 15 Fwy to the 91 and Home. Estimated total miles about 230 for the day. I do notice that the road Star seems to be running a bit rough so it may need some service now that it has 23,190 miles on it.